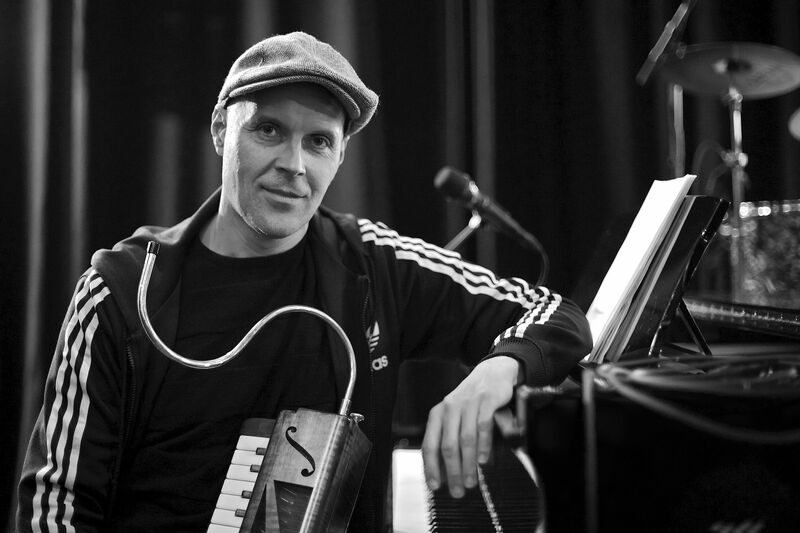 Martin Fondse (Bergen op Zoom, 1967) plays the piano and Vibrandoneon (the baroque version of the melodica) and is, additionally, renowned as a jazz and contemporary music composer and arranger. Fondse studied piano and popular modern music at the ArtEZ University of the Arts, Arnhem, under the tutelage of Robert Vermeulen and Rob van de Broeck. He studied composition at the Cologne Conservatory of Music under the American trombonist, composer and arranger Bob Brookmeyer, where he learned to approach arranging music as an exercise in “recomposition”, among other things. He also took piano lessons with Kenny Werner in 1996. Fondse began taking an interest in the expressive possibilities offered by the Vibrandoneon in 2009, and has employed the instrument in both solo and ensemble performances ever since. Martin Fondse has a preference for large ensembles and has established several of his own. He mostly plays his own compositions, which range from solo pieces to works for symphony orchestra, all of which are characterised by his distinctive humorous, narrative style. His musical universe is extensive, and reflects a love for exploring the customarily accepted boundaries between genres and for blending disparate worlds of sound. Fondse established his first group, De Achtbaan (later renamed the Martin Fondse Oktemble), in the 1990s, and with it adopted a humorous, cartoon-like approach to performing his compositions, alongside more melancholic work and free improvisation. That ensemble paired young talent with seasoned figures. It was followed in 2000 by the Groove Troopers, the small big band with which he explores the territory between the traditional big-band repertoire and modern dance music, weaving in strains of jungle music and tapping into grooves normally employed in pop music. Seven years later the Starvinsky Orkestar was born (renamed the Martin Fondse Orchestra in 2013, or MFO for short), an ensemble comprising musicians and musical instruments from the classical music world alongside jazz musicians. Fondse has received composition commissions from the North Sea Jazz Festival and the VPRO (for the SJU Jazz Festival). He has further composed and arranged music for a wide range of ensembles and orchestras, including the Royal Concertgebouw Orchestra, the Metropole Orchestra, the Netherlands Wind Ensemble, the Jazz Orchestra of the Concertgebouw and the Big Band of Hessischer Rundfunk. Recent years have seen him working closely, and internationally, with the Brazilian star Lenine, Peter Erskine & Doudou N’Diaye Rose and Matthew Herbert, and leading Orquestra Tom Jobim (BR). In the Netherlands, he maintains long-standing collaborative relationships with Eric Vloeimans, Mete Erker, Eric van der Westen and Remy van Kesteren. In addition to working as a musician and composer/arranger and leading his own ensembles, Fondse is a much sought-after mentor and orchestra leader. Consequently, he oversees XL Jazz, an annual project with skilled amateurs, semi-professionals and emerging talent; he was the artistic director of the BEAM Orchestra; and more recently (2015 – 2017), the artistic director of the Sena National Youth Jazz Orchestra (NJJO). Martin Fondse has released twelve albums under his own name and appeared on many more as a composer, arranger or sideman. He has composed film scores for several animation and feature films, and has received both national and international awards for these as well as for his orchestral work, including the Zilveren Notenkraker (2016, NJJO), the Edison National Jazz Award (2012) and an award for his score for a Dutch entry for the Oscars (Phantom of the Cinema, Animated Shorts category, 2009).